Samsung U Flex premium headphones have been unveiled. It has a bendable design and Bixby button especially for Galaxy S8 and Galaxy S8+ smartphone users. These premium headphones are rugged and can withstand even harsh conditions. The neckband of U Flex is flexible up to 100 degrees. This means it can be easily carried in a small hand bag or even in our pockets. The control ports are located on both ends of the neckband. The music playback control buttons, power button, and a Micro-USB port are placed on the left. Whereas, Active Key button which is used for customizing various functions in the clock timer, Samsung Health, favorites or voice assistants like Bixby is on the right. If your smartphone doesn’t support Bixby then you’ll be able to use S Voice on other phones of Samsung. All of this can be controlled through the Android App called the Samsung Level app. Samsung U Flex headphones have a dual drive setup. Both the earbud have an 11mm woofer and an 8mm tweeter. These are for delivering clear highs and powerful bass. The premium headphones also support Samsung’s Scalable Codec technology that does the analysis of ambient interference coming from Wi-Fi. This is creating a better range and more stable Bluetooth connectivity. These headphones will be available in colors like Blue, Ivory trims and Black. Although, we still don’t know about the pricing and availability. However, we can expect these remaining details to release with Galaxy Note 8 launch on 23rd August. The Samsung Scalable Codec technology will work only with a compatible Samsung smartphone. Some other features are P2i nano coating which is for protecting the headphones from light water splashes. 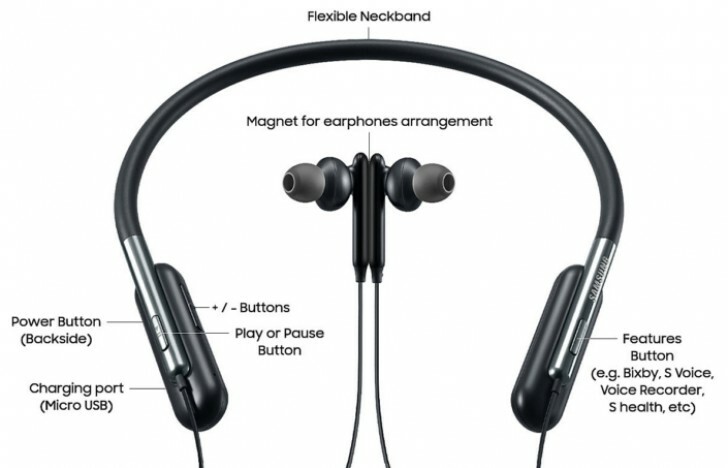 Samsung U Flex headphones have a battery backup of 10 hours and also incoming calls vibration alerts. We should get to know more details about this product when it will get commercially launched. However, it will be interesting to wait and watch what new Samsung has to offer in comparison to LG Tone Active+ and Sennheiser Momentum In-Ear Wireless headphones which come in the same price range.